Azerbaijani President Ilham Aliyev received credentials of incoming Djiboutian Ambassador to Baku Abdi Ibrahim Absieh on November 14. The ambassador passed along a ceremonial guard of honor. The Djiboutian ambassador presented his credentials to the Head of State. President Aliyev then had a conversation with the ambassador. Abdi Ibrahim Absieh conveyed greetings and best wishes of Djibouti President Ismail Omar Guelleh to the Head of State. He said there was great potential for enhancing the cooperation between the two countries, saying he would spare no efforts to contribute to this. The Head of State hailed the current state of the bilateral bonds between Azerbaijan and Djibouti. President Aliyev praised the two countries' support of each other in international organizations as a good signal of cooperation. The Head of State asked the ambassador to pass on hiss greetings to President Ismail Omar Guelleh. On the same day, President Aliyev received credentials of new Angolan Ambassador to the country Joachim Augusto. 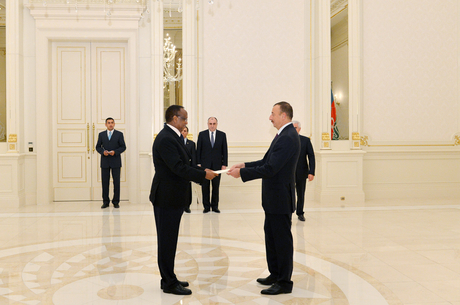 Ambassador Augusto handed over his credentials to President Aliyev. Joachim Augusto stressed the importance of expanding the bilateral ties. The Head of State said there was great potential for development of the bilateral ties with Angola in a variety of fields, especially in economic field. President Aliyev also accepted credentials of new Ambassador of Albania Genci Mucaj. The diplomat passed along a ceremonial guard of honor. The ambassador presented his credentials to the Azerbaijani President. President Aliyev had a conversation with the diplomat. Genci Mucaj conveyed greetings of Albanian President Bujar Nishani and Prime Minister Edi Rama to the Head of State. The ambassador praised the strengthening of Azerbaijan's international position under President Aliyev's leadership. The Head of State said the bonds between Azerbaijan and Albania were developing successfully. President Aliyev said Azerbaijan was keen to boost cooperation with Albania. He stressed the importance of joint energy projects. The Head of State noted there were good opportunities for developing cooperation in various fields of economy. President Aliyev asked the ambassador to deliver his greetings to the President and Premier of Albania. Later, President Aliyev received credentials of new Kuwaiti Ambassador to the country Saud Abdulaziz Mohammad Al-Shamlan Al-Roumi. Mohammad Al-Shamlan Al-Roumi handed over his credentials to the Head of State. The Head of State said bilateral ties between Azerbaijan and Kuwait are based on principles of friendship. President Aliyev stressed the importance of the two countries' support of each other within all international organizations, saying there was great potential for expanding the cooperation in economic field. The Head of State expressed confidence that the newly appointed ambassador would spare no efforts to contribute to strengthening the bilateral ties. The ambassador conveyed greetings of Emir of Kuwait Shaykh Sabah Al-Ahmad Al-Jaber Al Sabah and Kuwaiti Prince to the Head of State. He also congratulated Ilham Aliyev on his re-election as the president. Saud Abdulaziz Mohammad Al-Shamlan Al-Roumi noted the Kuwaiti Emir attaches great importance to enhancing the bilateral bonds with Azerbaijan. The Head of State asked the ambassador to deliver his greetings to the Emir and Prince of Kuwait.